Brand Analytics continues to follow the elections in France and now, a day before the vote, publishes a final second round results forecast based on social media data. Besides the forecast, we also present our latest project: «Citation rating of French-language media resources» for April, 2017. What is our reason for doing so? If we remember the past case of the elections in USA, we can see that it was a victory of social media over the traditional media as a more potent channel for political marketing, but in the case of France, it is different. The mass-media, along “their” candidate, which is Emmanuel Macron, are ahead. Now let’s see the distribution of media power. Who will become the Republic’s president tomorrow? 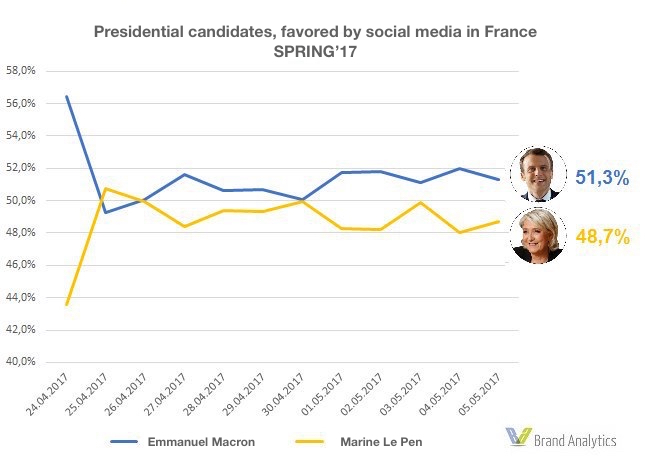 A day before the final round, the popularity gap between the candidates is slowly closing, with Marine Le Pen gaining a 0,7% of support from social media users. On May 6th, the percentage of social media users supporting Le Pen is 48,7%, but her rival, Emmanuel Macron is still in the lead with 51,3%. In the 2 weeks that passed since the first round, more than 3,5 million users have “voiced” their support for one of the candidates. The mentions peaked on May 4th, when social media users started discussing the past day’s debates. It is also worth mentioning that while the press was fanning the information flames around the debates, savoring the candidates’ accusations of each other, the social media users mostly took the “talk-show” with irony. While the debates were in progress, social media users posted numerous jokes about how empty the debates are and how the accusations have no sense besides the loud words spoken. The main topics of users’ irony were the Marine Le Pen’s weak program and her accusations towards the actions of Macron as a minister. For esample, the tweet saying «Yes, Mr. Macron, the death of Dumbledore in the 6th book of Harry Potter is also your fault – you were a minister when it happened» (t.co/WqvEV6EDDV) has more than 64 000 retweets. Another joke about Le Pen that collected 46 000 retweets: «My program? Oh, did you know that Mr. Macron was fined for driving with a cracked rearview mirror in 1996?» (t.co/i7TPLdqQwJ). Because of a low amount of interesting points during the debates, the mass-media articles didn’t get a lot of mentions and the social media users took them rather calmly. The France’s election campaign had its share of the new. For the first time the acting president decided against trying to get elected for a second term. And for the first time the «classic» political ideologies – socialists and the right-wings were overboard of the elections ship. But even with all those “landscape shifts”, the traditional media managed to keep a serious influence, even regardless of a sharp surge in social media user activity, which amounted to more than 30%. But this activity was neither targeted, nor controlled. The citation of Mass-Media and other media resources in social media have also experienced a great increase – nearly 20%, judging by Top — 25 most quoted media, which we present below. Another fact worth noting is that unlike many French sources, the foreign media that have a French-language version have mostly grew in popularity. The most notable examples of such media are American huffingtonpost.fr and fr.news.yahoo.com, as well as the Russian francais.rt.com and fr.sputniknews.com. It was those last two that were refused accreditation by Macron, who also blamed them for spreading the disproved fake news, and after the last day’s leak of data from his election headquarters, he blamed it on the Russian media, which was not hard to anticipate. Returning to the rating, we will again mention the sharp increase in social media mentions for the traditional media, especially for the rating’s leaders – lefigaro.fr, lemonde.fr, bfmtv.com, as well as the “foreign” media. The overall citation for the Top-25 has increased by more than 20%, from 1,57 million links in March to 1,86 million in April. The unified rating of media resource citation combines the citation data for TV-channels, press, blogs and popular online resources. This rating was made to show who exerts the most influence on the society’s overall information field. The research is based on AUDITED data: on confirmed links from popular social media and online sources, clear from spam and bot-made messages. The research did NOT use the social media counters under the materials, because this method doesn’t allow to verify the data, to clear out the artificial messages and the mentions from Russian-language social media segment. 2. 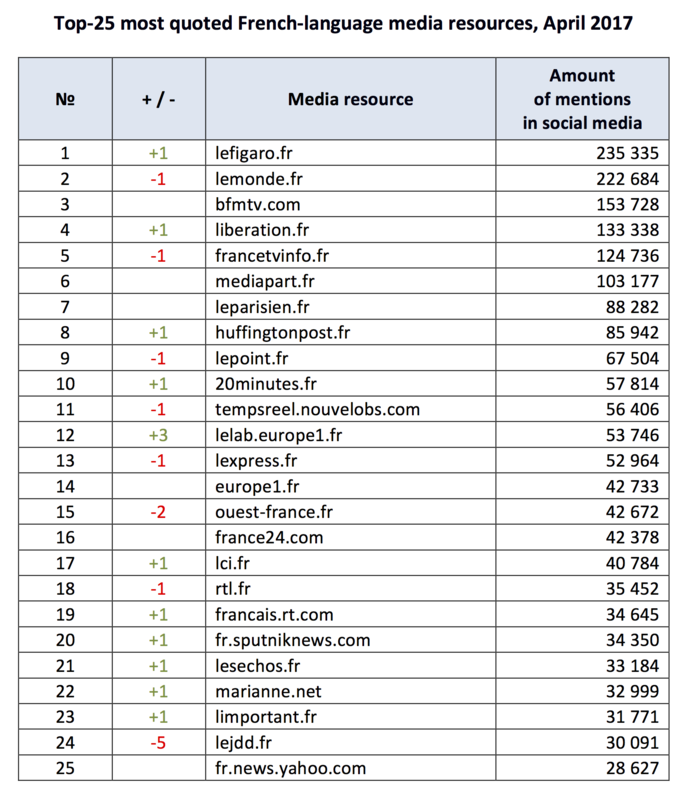 Popularity of link shorteners among the large French media (on the bit.ly platform), that makes processing the social media data significantly harder, because it requires special procedures to get the initial non-shortened link to any certain media outlet. For the purpose of making this rating, we processed more than 40 french-language publications, made during the last month in social media. In those messages users posted 50 million links to outside resources, from which about 25% were «short links» (like t.co, fb.me, lemde.fr, etc.). The collected data came from the popular social networks and services: Twitter, Facebook, Instagram, YouTube, G+, as well as forums, blogs, news articles and comments to them, themed websites and discussion communities. Brand Analytics analytical center is one of the largest research structures that specializes on global social media monitoring in Russia and abroad. All of the information field and event forecast projects are based on the unique system that collects and analyses public social media messages in real time. Today, it processes more than 50 million messages per day and its data archive, started in 2013 contains 50 billion pieces of data. Запись опубликована в рубрике Исследования, Рейтинги. Добавьте в закладки постоянную ссылку.